Inside the new Rachel’s Ginger Beer in University Village is a new branch of Ma’ono, bringing its famed fried chicken from West Seattle to a new form: the chicken sandwich. Chef Mark Fuller may be scheming a New York-style pizza spot in West Seattle, but he can’t seem to quit chicken. 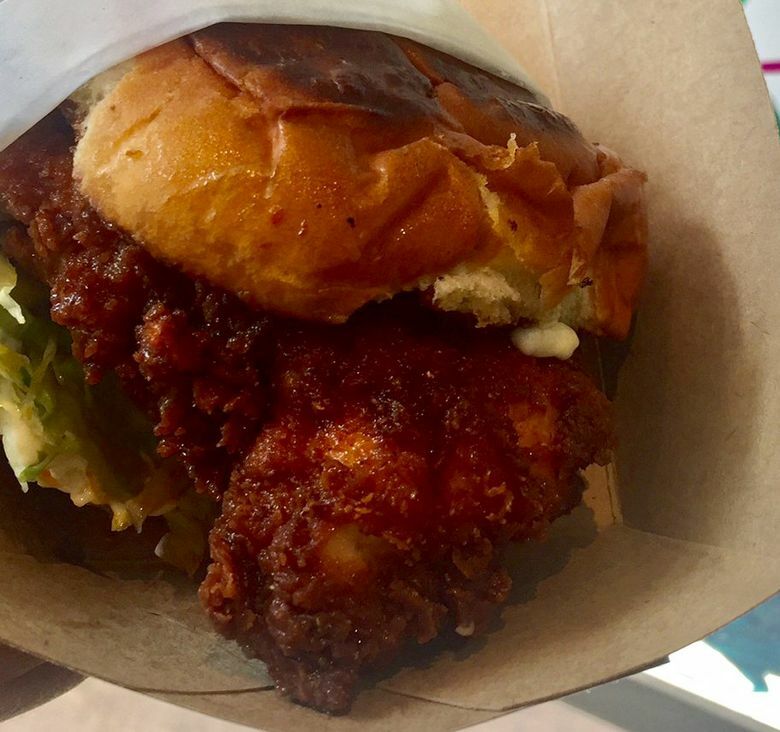 The chef, who boasts some of the city’s best fried chicken (Ma’ono in West Seattle) and elevated the General Tso’s at New Luck Toy nearby, does chicken sandwiches now in the spirit of Chick-fil-A. My, this Ma’ono is a small place, a walk-up window inside Rachel’s Ginger Beer at University Village. The menu seems to orbit just around the fried-chicken sandwich; other offerings felt more like add-ons to fill in the holes. But it’s a good sandwich, and, in this modest setup, Ma’ono seems to strive for nothing more than that. The menu: The chicken sandwich ($11) comes with Fuller’s Hawaiian and Asian tweaks — served on a toasted King’s Hawaiian Sweet Roll, topped with daikon pickles, Kewpie mayo and iceberg lettuce and a brush of lard. Add cheese sauce for $1.50. It comes with six levels of heat, topping off at “Bring the Pain” spicy with Carolina Reaper and Ghost Chili peppers. It may be the only menu in the city where the spice warning sounds just as much like a frat dare. “BURN ALERT: No returns or refunds on your choice of spice. Choose at your own risk!” The fried tofu sandwich ($10) and chicken fingers ($8) are the other two main offerings. There’s also two salads and four side options from fries ($4) to mac and cheese ($5). Don’t miss: The fried-chicken sandwich, brined breast coated in a thick batter — juicy white meat and a crunchy texture with all the expected flavors: tangy, spicy, salty and sweet. The chicken is an umami bomb, seasoned with bonito flake, toasted konbu, tomato powder, shiitake mushroom powder, garlic powder and soy sauce powder among other spices. The dressed-up fries, coated in melted white cheddar and dripping with a shiitake-mushroom chili were soggy but satisfying. What to skip: Not bad, but the chicken fingers felt like a mere vessel just to dip into the hot honey-mustard. The overcooked elbow pasta resulted in some mushy mac and cheese but without that gooey, gluttonous goodness of the chili cheese fries. And the cold, roasted-broccoli salad (mashed up boiled egg, Parmesan, garlic and lemon vinaigrette) tasted like leftover potluck fare. The setting: Its storefront looks congruent in color scheme and décor to the boutiques dotting this shopping center. But step inside and “Jungle Boogie” blares over head and you’re greeted by whimsical, anthropomorphic murals by the door. Like Nacho Borracho and the other Rachel’s branches, it’s two separate businesses under one roof; order and pay for your food at the Ma’ono’s walk-up window. For drinks, order at Rachel’s bar. Those under 21 are allowed here. Prices: A chicken sandwich, chicken fingers, roasted broccoli and chili cheese fries totaled $35.78 after taxes, enough food for two for lunch.